Independent agents are facing numerous challenges these days. First and foremost, the market is shrinking. For those in the life and health insurance field nationwide, many are considering diversifying business or leaving the field. Before making these types of decisions, here are some things you should consider. As a life and health insurance agent, the upholding of the Patient Protection and Affordable Care Act (PPACA) by the Supreme Court has most likely had an impact on your business. Many health insurance producers have had their commissions slashed up to 50% by health insurance carriers to comply with the medical loss ratio (MLR) portion of the PPACA. Also, many agents believe new health care exchanges will reduce the volume of business underwritten by health insurance agents. Although some experts believe health insurance offered on the exchanges will be uncompetitive for the healthy clients. While prospects appear to be bleak, there is still some good news! Many experts believe that agents will still serve an important role for their clients. Most experts are starting to see the Health Insurance Exchange options as a place primarily for clients with pre-existing conditions, with “healthy” individuals still purchasing through their employer and through the traditional individual market. In addition, life and health carriers are expanding their product offerings for their agent distribution to sell. Many agents are already replacing major medical commission revenue by selling more ancillary health and supplemental benefit products. For those agents looking to expand their product offering and thinking of entering the property and casualty world, here are some things to consider. A review by Independent Insurance Agents & Brokers of America (IIABA) revealed that independent agents and brokers still control the majority of the P&C market, writing 56% of all premiums and a third of all personal premiums. Being an independent agent provides freedom from strict company P&C captive regulations. An agent can still cross-sell other lines of insurance and maintain the ability to sell a policy through another affiliated insurer if a primary insurer cannot write the policy. Staying an independent agent allows you more freedom to recruit others to work under you and teach them how to be successful in developing professional relationships with clients. And adding a P&C practice can include as few as one or two people. Another item to consider, independent insurance agencies are starting to embrace outsourcing in order to combat today’s new hurdles and a potential shortage of staff. The average producer spends only 41 percent of their time on sales, says The National Alliance Research Academy’s most recent Producer Profile: Compensation, Production, and Responsibilities. 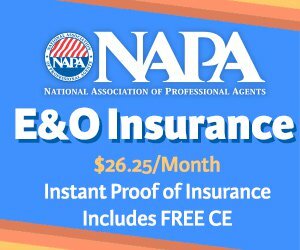 And finally, according to a study by the National Online Insurance School, the employment rate for licensed insurance agents is projected to increase 12% over the next seven years. With numerous amounts of aging independent life insurance producers retiring and the majority of newcomers with little to no experience—approximately 85% of newcomers typically struggle and leave the business within the first four years—if you are an experienced health agent looking to expand your business, the current state of the life insurance market might provide a great opportunity. Look to new products, diversify and you can still be successful. Where there is change there is opportunity. Being an independent agent has proven to be beneficial in the long term and with a lot of hard work, the benefits can certainly outweigh the risks.